Surprise! The whole menagerie has gathered for a big birthday celebration! Set the stage for your party with the banner, balloon, presents, and cake and then make your guest list – there’s a barnyard full of friends to invite and they come bearing gifts and they’re dressed to impress. This 20 piece set includes: Pigs (3) 5/8” x 7/8”, 5/8” x 7/8”, ¾” x 1 1/8”, Cat ¾” x 1”, Cow 1 ¼” x 2 3/8”, Horse 1 1/8” x 1 ½”, Chicken 1 ¼” x 1 5/8”, Presents (2) 5/16” x 3/8”, 5/16” x 9/16”, Balloon 5/8” x 1 ½”, Cake 9/16” x 15/16”, Banner 2 ¼” x ¼”, Sentiments (8) ranging from 1 ¼” (Tnank Moo) to 3 3/8” (Simply Wonderful…That’s You) in length. 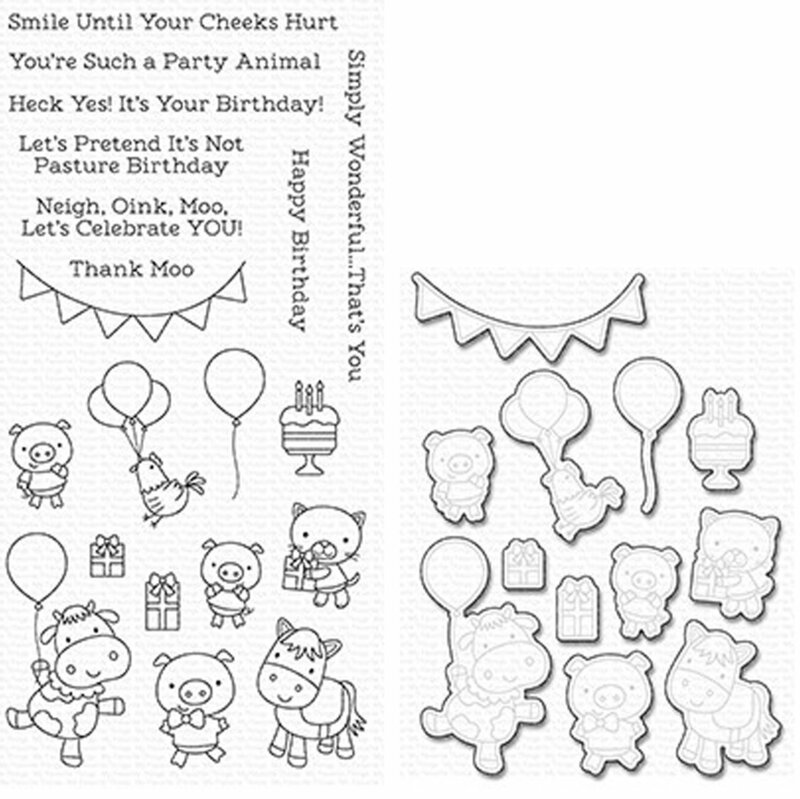 This Die-namics coordinates with the Party Animals stamp set for perfectly sized die cuts every time. It is open inside to allow you to stamp then cut OR cut then stamp. This feature makes the Die-namics lighter weight and allows for easier removal from the die. This 12 piece set includes: Pigs (3) 3/4” x 1”, 3/4” x 1”, 7/8” x 1 1/4”, Cat 7/8” x 1 1/8”, Cow 1 3/8” x 2 1/2”, Horse 1 1/4” x 1 5/8”, Chicken 1 3/8” x 1 3/4”, Presents (2) 7/16” x 1/2”, 7/16” x 11/16”, Balloon 3/4” x 1 5/8”, Cake 11/16” x 1 1/16”, Banner 2 3/8” x 3/8”.